Providing you the best range of ac motor drives and motor drives with effective & timely delivery. We offer the high quality of AC Motor Drives. 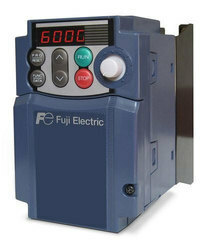 Dynamic Torque Vector Control System, Fuji Electric original dynamic torque vector control system is known for its top-of-the line performance, delivering stabile torque output even at low speeds. This feature has a wide range of applications, including conveyors and high-inertia loads that demand high starting torque. The slip compensation controller works with voltage tuning for even more accurate speed control at low velocity. This reduces speed control variability and stabilizing creep speed for more accurate stopping in conveyors and similar equipment. Delivers all the usability of the C1. Provides volume of frequency and the same ease of operation as the current model. USB Keypad Optional USB keypad available. We offer the Motor Drives to our client. Customizable logic function is available as a standard feature. FRENIC-Ace has built-in customizable logic functions with a maximum of 200 steps including both digital and analog operation functions, giving customers the ability to customize their inverters-from simple logic functions to full-scale programming. Fuji Electric also has plans to offer programming templates for wire drawing machines, hoists, spinning machines, and other applications so that the FRENIC-Ace can be used as a dedicated purpose inverter. USB keypad Connect to a computer for more efficient operation (set-up, troubleshooting, maintenance, etc) FRENIC-Ace is equipped with STO functional safety function as a standard. Life conditions Ambient temperature +40 DegreeC Load rate 100% (HHD specifications)80% (HND/HD/ND specifications) specifications have a rated current of two sizes higher than HHD specifications, so the life is 7 years.